The Sanchez Art Center presents the annual Arts on Fire Awards Exhibition featuring the work of Shelley Gardner & Drew Goings. Their work was selected by Jack Rasmussen, juror of the 2004 Arts on Fire exhibition, from over 65 artists for this two-person exhibition in the Main Gallery. 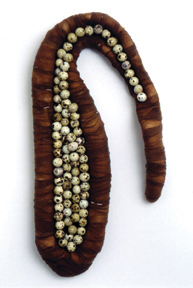 Gardner will exhibit her recent abstract sculptures using natural materials and forms. Goings will exhibit his meticulously rendered paintings of Americana neon signs. Shelley Gardner’s source of artistic inspiration is the natural world. Recently, with a yard of her own to care for, she has become increasingly aware of the cyclical rhythms in the natural world. She is fascinated by the unique and often strange ways plants manage to insure their reproduction in a hostile environment. Using materials such as seeds, pods, rocks, eggs, wax, and fibers, she attempts to mirror the slow cumulative processes of nature. Her multi-layered surfaces are the result of observation of the way in which seemingly small and insubstantial matter can slowly coalesce into a solid and enduring form. The development of seed pods, the formation of crystals, the sediment of a river bottom, are all examples of the processes used in her work. Shelley received her M.F.A. in Sculpture from the California College of Arts and Crafts. She also attended Humboldt State University and the San Francisco Art Institute. 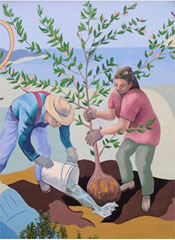 Shelley has exhibited her work widely throughout California including the Napa Valley College Gallery, California State University Stanislaus, Dean Lesher Regional Center for the Arts, Olive Hyde Art Gallery, San Luis Obispo Art Center, Angel's Gate Cultural Center, Crocker Art Museum and the Sonoma Museum of Visual Art. 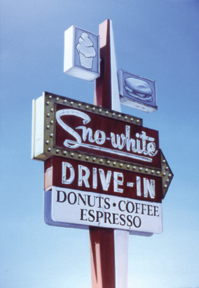 Drew Goings paints the business signs we encounter every day. These signs – mostly neon – are older, neglected, and often only occasionally used. Most people pass these business signs daily without notice. Yet they are an art form in themselves. Often intended for viewing at night, the glow of the neon beckons passers-by to a place to sleep, to eat, or buy their liquor. Viewed in sunlight, these signs can look rough, even awkward. Flaws, peeling paint, and dirt are all revealed. These unique signs lie hidden beside the mass-produced chain store signs seen in every town across the country, waiting patiently for night to fall and their chance to shine. Drew was born in California and grew up in upstate New York. He studied art at the State University of New York, New Paltz and Arizona State University. Goings comes from a family of artists; his father is the photorealist painter Ralph Goings. After doing photography for a number of years in California and Arizona, Drew recently returned to painting after a 20-year break. He has worked for contemporary art galleries in Scottsdale, Arizona, and assisted companies with their handling and acquisitions of their corporate art collections. He has worked as a commercial photographer and graphic artist in Phoenix, San Francisco, and the Virgin Islands.